Structured data is incredibly important. Many of the current and future search enhancements are — or will be — powered by structured data. While search engines are good at reading content, structured data can help them to understand. Yoast SEO has supported some basic Schema markup for ages, but now we’re going much further. Yoast SEO 11.0 features a completely rewritten Schema.org implementation — the first one of its kind, offering a fully integrated graph. Optimizing for entities — i.e. people, places and things — and how they relate to each other makes a lot of sense for search engines, as it gives them all your connections on a silver platter. With structured data, they can much more easily understand what your pages are about, and the properties of those things. It can help them understand that this web page is an article about a product, made by a specific brand. They no longer have to figure everything out themselves, by just reading content and following links. Note: Search engines will still follow links in order to discover content and to help them to understand those relationships, but entities help them to really reinforce that knowledge. Google is moving from a search engine to a discovery engine in an effort to provide searchers with relevant content, answers or products before they even know they need to search. There’s a reason they called Google Discover just that. Google is looking for concepts and connections to help them understand the world, and to present these in new ways. Rich results will become much richer as time goes by. Good SEO strategies must consider entities. That’s why we’ve paved the way to help you tell Google exactly what your site is about — automatically — just by using Yoast SEO 11.0. Now, we build an entity graph for you, behind the scenes. An entity graph is a representation of a topic, which describes the entities — people, places and things, for instance — and defines their relationships via properties. Or in this case, how your site is connected to your pages, organization, authors et cetera. The age-old problem with structured data is that adding the necessary code is tricky. Schema structured data relies on JSON-LD to get that data to search engines. Yoast SEO has added bits and pieces of structured data for ages, but Yoast SEO 11.0 raises the bar tremendously. And you don’t have to do much to make use of it. Just fill in the information we ask — simple things, like if your site is for a person or an organization — and you’re good to go! Traditionally, every piece of structured data added by WordPress plugins or content management systems itself was put in contained little blobs. This lead to pages having many individual pieces, which had no way of talking to each other. And since the end goal of working with entities is to make connections for discovery, something had to be done. Working on a document set up by Jono Alderson (with input from Google engineers, among others), we set out to rewrite how to best approach implementing Schema markup, and how WordPress can use this efficiently. Not only that, it had to be extensible as well, so every piece of structured data out there can hook into this proposed standard. Yoast SEO 11.0 comes with a completely rewritten Schema structured data implementation. This new implementation uses a concept that is different from most other approaches to structured data. Here, we’re not relying on complicated arrays of nested properties, but a clean, complete graph that uses IDs to connect different nodes inside of it. The end result is stunningly effective. As an end user, you don’t need to know much about what goes on behind the scenes of Yoast SEO. Looking at structured data code, however, helps your understanding of how everything fits together and why you should fill out the information we ask in the plugin. As an SEO or a developer, you’re really going to enjoy this beautiful piece of interconnected code. Here’s an example output of Yoast SEO new Schema implementation, seen through the eyes of Google’s Structured Data Testing Tool. This is generated for one of our most popular articles: WordPress SEO — The definitive guide. You can test the article yourself in Google’s Structured Data Testing Tool. Because yes, there’s more to the screenshot above. Yoast SEO will now output a lot more structured data about your website and how its pages fit together. The structured data is based on the initial setting of Person or Organization. If your site represents an organization or business, please select Organization. If the site is your personal blog or anything representing a person, please select Person. You’ve probably set this up correctly ages ago, but there’s no harm in checking again. Yoast SEO will automatically fill in the correct structured data with whatever you fill in during the setup of the plugin, or later in the settings of Yoast SEO. You can switch between these two settings in SEO → Search Appearance → General. 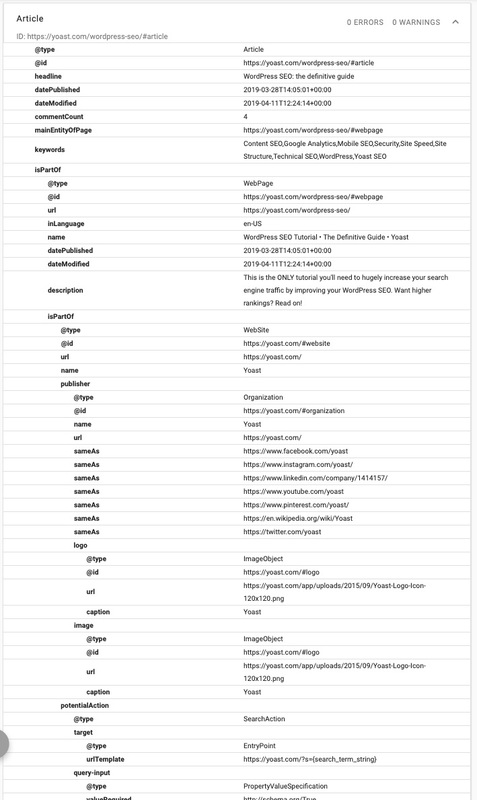 Here’s a very high-level overview of the types of structured data we produce. We output a so-called “base script”. This a @graph object in JSON-LD, which describes the Organization or Person, the WebSite and WebPage. These parts are on every page and will be appended with structured data specific to the page you are currently on, so an article on your site will get all of the above plus article Schema. You can find a complete overview in our Schema documentation, that includes the specification for integrating structured data that we’ve used to build this. Based on Person or Organization setting. Uses WebSite for site-level specifics. Uses WebPage for page-level specifics. Single pages: like homepage, plus date information and breadcrumbs. Single posts: adds full Article and Author support, the latter only when the website represents an Organization or the author is not the Person. Supports loads of properties, so see the code example above for an idea of how the Article code works. Taxonomy and date archives: a single page with CollectionPage as WebPage. Post type archives: a single page with CollectionPage as WebPage. Author archives: a single page with ProfilePage and Person. Search result pages: type of WebPage becomes SearchResultsPage. 404 error pages: Like the homepage but without WebPage. This leads to the following base script generated by Yoast SEO. This will be extended based on which page you are. For local SEO, having correct Schema structured data about your business is essential. Combining this with a Google My Business account, for instance, helps make it clear to search engines what your business is all about. In the new Schema set-up for our Local SEO add-on, we now offer multiple ways to correctly specify what do with a single or multiple physical locations, for instance. Our Local SEO Schema documentation has more information. For WooCommerce e-commerce sites, our WooCommerce SEO plugin now takes the standard outputted Schema and builds a product graph that actually makes sense. We now make sure everything is connected like it should, for products as well as sellers. Read more about the output in our WooCommerce Schema documentation. Our News SEO plugin now converts every article into a NewsArticle, and adds a publication year and copyright holder to give you a better chance of ending up in that coveted Top Stories carousel. More on that in the News SEO Schema documentation. We’ve built our Schema framework to be extended. It’s pretty straightforward, and we ask everyone working on these kinds of implementations to adapt this. Together, we can truly put the Linked Data part in JSON-LD and link up large parts of the web — something that benefits us all! Start with the Schema integration guidelines. But wait, there’s more coming! With this intelligent, innovative Schema framework in place, we are working hard on rebuilding and expanding our structured data content blocks for WordPress’ block editor. These blocks help you visually build content like how-to’s, FAQ’s, recipes and job postings. In the background, it automatically generates Schema structured data that neatly ties into the graph we build for that page. How awesome is that! More on that soon. So there you have it. 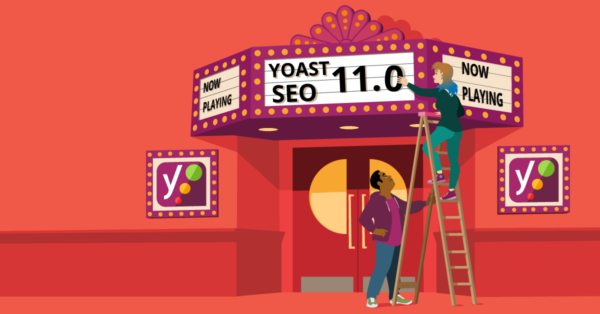 Yoast SEO 11.0 features a brand-new, revolutionary Schema implementation — one that is destined to give search engines all your connections on a silver platter. This is a great development, not only for you and for search engines, but, more importantly, for the web in general. Become a Yoast SEO plugin expert! When Yoast updated to version 11.0 we now have a large band of html showing at the top of our website! We have had to turn off Yoast loosing our titles and meta! We’ve had reports from a few people with similar problems when they’re running a plugin which removes our HTML comments – specifically, optimisation plugins or theme filters which remove the word ‘Yoast’ from the page’s source code. Have you tried turning off any such plugins, or, checking for any PHP code which might be removing those comments? I’ve tried turning off all other plugins but still seeing a whole load of html at the top of each page when live. Turning Yoast off and all is OK. The code does look like Schema, would it be possible to install an earlier version of Yoast to avoid this issue? Hmm. Do you have an example URL? Happy to take a look! My website’s account got suspended while doing link building on various online platforms can you please suggest to me why this has happened. For couple of years, I focused on wordpress security. And your stupid update is now exposing the username to public through view-source. Sorry you feel this way. You’re welcome to disable our output, using the guide outlined here: https://developer.yoast.com/schema-documentation/api/#disable-schema. That said, if your concern is that our plugin is exposing the author of a post in the source code (as it’s meant to, as part of outputting the schema graph), then you might have deeper issues – chances are that information might already be exposed in the WordPress REST API, in RSS feeds, and in other places. If our plugin is able to access the post author’s username, and you think that this is a security issue, then your theme/plugin isn’t protecting this information effectively. Unfortunately, the new upgrade isn’t compatible with Time.ly calendar (not using Gutenberg) and the Content Optimisation tab options are blank while the Social and Advance tabs works fine. In other words, this version makes Yoast SEO useless for my calendar posts. It works fine with normal posts using Gutenberg. I found many people using Yoast SEO who have commented in this issue. Some users suggested to downgrade the version to previous one but I can’t find a way to do so. Quite annoyed as it has a real impact in my google searches. Unable to update to 11.0. I get a “plug-in failed” message when I try. Please remove “Single title: H1s should only be used as your main title. Find all H1s in your text that aren’t your main title and change them to a lower heading level!” feature. I upgraded to version 11 yesterday but unfortunately only today I noticed the notice at the top of my site saying “Missing argument 2 for wpseo_json_ld_output_filter()” with a lovely stack trace. As you might have guessed this is owning to the breaking change you did in the “wpseo_json_ld_output” filter by removing the 2nd “context” argument. You have a responsibility not to make breaking changes in the upgrade! Fine, that filter is now deprecated and doesnt do the desired effect but for the very least it shouldn’t generate PHP notices! I hope you take this feedback to hear and pay more attention in the future to avoid breaking changes! Is the same title bug fixed? If it’s fixed are there any other issue? Please answer all the question as a single mistake can hurt a lot of sites. Can you please detail what you mean by “same title bug”? I updated to the new version but didn’t notice anything related to titles. Please add the ability to manually update the schema output, or at least disable the output altogether from admin. Some of us already run optimised schema markup, and this update will automatically override this with whatever Yoast thinks is right (which might not be). it’s not, it only removes some of it. WP Job Manager already issues this data to google for job postings so that they appear in Google Jobs. Will this plugin override those settings or respect them? They should play nicely together, though, there may be some different/conflicting markup. You can test via Google’s Structured Data Testing Tool (https://search.google.com/structured-data/testing-tool). After updating, there is no longer option to change site title and meta description for categories and tags. Hi I’m getting a warning and an error when I test my structures data now. They are both image related, the warning says an image is recommended and the error says it’s required. Also this is only on the post types not my pages. Hey Rudy, can you share which URL you’re getting the errors on? WHere do I go to set this schema up or is it just automatic now? It’s automatic, though, you should go and double-check your ‘Search Appearance’ settings to make sure you’re happy with the options. I’m running the Premium version on my two sites. When I try to update it, I get “Update Failed: Plugin update failed.” Maybe I’ll sit tight until 11.1 comes out. I have been getting the same error “Update Failed: Plugin update failed” every day I try. I too will wait for the next version to hopefully fix this. We’ve done lots of SEO on our site, including a little structured data as an experiment. I see a lot of details about the Yoast “plug-in”. But not much on concept. What makes it a plug-in? Does it install into the web browser, like Chrome? Our site has over 100 pages; am I going to have to edit every single page to add this tool? Does Google state that having this code in your web pages will increase search rankings? The attribute publisher.itemtype has an invalid value. This error is because Google doesn’t allow a ‘Person’ to be the ‘Publisher’ of an article. We think this is a bug with their code / approach / validation tool, and we’ve raised it with them. This is because Google doesn’t allow a ‘Person’ to be the ‘Publisher’ of an article. We think this is a bug with their code / approach / validation tool, and we’ve raised it with them. I like your approach to @id. It’s clean and easy to understand. Do you plan to add functionality to allow content creators to specify on each page and post the following? – What is the topic of this page? E.g. space travel (https://en.wikipedia.org/wiki/Space_travel)? – What entities are mentioned? E.g. Elon Musk (https://en.wikipedia.org/wiki/Elon_Musk)? That’s great. Thank you for the link. Thank you for the article and congrats on the great update. What was the thinking into whether or not to display the schema stuff ON the article page as opposed to just having it exist in the underlying page code? I know that some schema plugins already in existence had some thoughts on this. The main benefit of a JSON-LD approach (instead of a microdata/RDFa approach) is that we don’t have to tie the code to the on-page, visible content. We can make it all happen neatly ‘behind the scenes’. I have updated to Yoast SEO 11.0. But when I go to test a page in the structured data testing tool I can only get the result you achieved if I have created it as a tag in google tag manager. I thought the update was supposed to create schema so I wouldn’t need to do it manually in google tag manager? Have you tried turning off your rules in Google Tag Manager and previewing the page? It might be that some of the logic that you’re using in there is conflicting with ours. Do you guy have option to disable this feature? There’s no interface option, but there’s information in our API documentation – see https://developer.yoast.com/schema-documentation/api/ – on how the output can be managed or disabled. Thats geat news, i have a one question, can i use wp schema pro after updating yoast 11 version ? I am wondering the same thing, did you figure this out? yoast has grown into doing everything under the sun; which is okay but it feels a bit bloated, esp w/ all the upsells. some clear cut, delineating lines, on functionality would be nice since yoast is not the only seo plugin on the block. A big thank you to the Yoast SEO Team. Our journey with you has been terrific and full of learning. Our fledgeling SEO Content, Writing Services website, is benefitting from all your endeavours. Again thank you. Great to hear Mike, thanks! It looks like you’re grabbing tags to use as the “keywords” in the article schema. Since tags are used repeatedly and are general compared to the “focus keyphrase” used in the Yoast SEO panel, it seams like that would be a better way to go. Whoa—just took a look at a post and the readability analysis and Focus keyphrase sections are gone. “Yoast SEO Posts Overview” is gone from the Dashboard. Is this all intentional? What’s the plan, what’s the reasoning behind all of this? that looks and sounds like another plugin is interfering, as we didn’t change anything there. If you’re a premium customer, feel free to reach out to our support team! If not, disable plugins one by one to figure out what’s going wrong. Thanks for the tip, conflict resolved. I built custom theme for my site, I think I have to deactivate this feature, this really messes up the structure of my site. Why BlogPosting markup is not available? It is as popular as Article! Will you add it? We’d love to, but we’ve no way of automatically knowing whether a post (or, a post of a custom post type) should be considered a BlogPosting or not. Hope, you can add it soon. 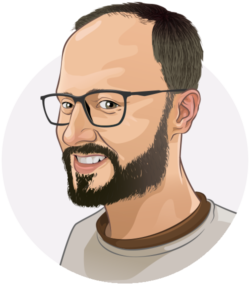 I would like to know the best and cheapest ways for me to master Yoast SEO and also the new local plugin. Thanks! I need to know, now that I’ve updated to 11.0, do I need to buy the Structured Data plugin through Yoast for $67 or whatever? I have a Schema plugin but want to use the Local schema through Yoast. Let me know what I should do. I tried to login to buy the local data plugin but it said my password for Yoast was wrong. Then the same password was able to login to my Yoast site. So I don’t know what’s wrong there. Just now updated to Yoast SEO, but JSON code appear before site header, so downgraded to version 10.1.3. Do you know how to fix this issue? What a horrible experience this is. Updated the plugin on a client site an suddenly, BAM, all kinds of schema printing to the header. Thanks for that! Added the wpseo_json_ld_output, and it’s still there. Very poor experience that may cause me to remove all versions of this plugin and revert back to one that gives us Webmasters the ability to do wtf we want, versus having it force fed to us. Thanks. You probably have an old filter to strip out yoast html comments in your theme which is picking up the class from the new schema data. It’s not yoast’s fault. You need to edit or delete the part in your theme/plugin which is deleting thins from the head of the document. Selecting publisher Person shows error publisher item.type not valid (posts article). I changed to organisation without adding the logo, that removed the error but showed logo missing error. Person type is not valid for Google? Sorry but I do not want YOAST manage my Structured Data. I’m using WP Schema Pro (https://wpschema.com/) and I’m great with it. How disable the automatic outpout of your code? A simple PHP snippet? Sorry, I meant the example below, reason being in order to not break future functions attached to the filter, you need to pass an array. Loading and then no option for a person? Fantastic release! I updated the plugin, ran a test on Structured Data Testing Tool and my Schema cards appear so professional!. Thank you so much!!! The schema will show on AMP or not? I have been using WordLift to do this, but it seems much more intense. Does this take the place of that? Also, is this already in premium as well? I was waiting for this released! I’m heading to testing structured data in my website using Yoast. You guys are awesome. I have version 10.1.3 Premium, and it indicates it is up to date. Is v11 a paid upgrade? No you should be getting that soon, might be cached for a little while though. When is the premium version 11.0 ? Thanks a lot. Today found a message to update person/company. That I updated. But didn’t know much about the new update. Will check more now. Does it mean, this update will replace the schema plugins? I was looking for this schema setup. Do I need to do anything now? Do I have to review settings in Yoast? There’s one changed setting, that only applies if you had set your site to represent a Person. If that’s the case, you’ll have a notification in your settings from us, and you need to select which User your site represents. Other than this, no need to do anything. I’m waiting for Latest Yoast SEO. And it’s finally released. Had to dig in to plugin code and remove the classes “yoast-schema-graph yoast-schema-graph–main” from function schema_output() to fix this. The same thing for me. It broke all my sites. On all of them (on each page) was shown a multi-line ugly code that was visible to everyone because of the unopened “script” tag. The most unpleasant thing that I was away and did not see anything, and the sites were displayed for several days in such an ugly way. Fix from Gleb helped (by the way, thanks, Gleb). But still, the situation is very bad and needs more correct fix. Are you running any plugins that interfere with Yoast SEO on that one site? Maybe to strip comments or other stuff? Actually not, I even tried to disable most of the plugins such as Yoast news, amp glue and some others… Same set of plugins with latest yoast seo plugin dont have this issue on another server, which is even more strange. Thank you for the article and congrats on the great update. I do have one question. I currently use a custom WordPress theme that has very specific schema markup (microdata) for reviews and so on. So for this website I do not need the entity graph in Yoast Seo 11. It may even clash with my current schema setup. Right now I haven’t updated yet and I don’t have anything selected (person or company). How should I go about this? Simply update and leave the knowledge graph as it is now? Honestly, I’m curious which theme that is, in our reviewing we’ve not found a lot of code that really works nicely. If your theme already disabled our Schema.org output, that will still work, if it doesn’t it should, or it should tie into it. There’s full developer documentation available so feel free to point your theme’s developer at that. I build custom themes and all have schema built in for different post types. Will the new schema coming from Yoast overwrite what is already there and potentially be detrimental to the site? EG. If I have a custom post type for ‘jobs’ which has markup for job postings, will the new schema override what is already there? I’ve tried to test with the tester tool before updating the live site but the result is not clear. I see multiple sets of data, Yoast saying the page is one thing and my existing data saying another. I have to update this site for event date, so I will look at integrating that into your plugin, but I’m curious to know if this has been tested with sites that already implement schema. Yoast, please address custom post types…because this update could be fantastic for (or sabotage) more advanced sites with cpt’s. Thank you for replying. It is a custom theme made by me specifically for that website. The schema is hardcoded into the templates themselves (microdata). It’s not ideal, but at that time it was the fastest way of getting schema. And it includes all the necessary things like the name of the reviewer/author, the name of the product being reviewed and so on (this info is retrieved from custom fields), so it’s fine in that regard and wouldn’t really need new schema functionality. 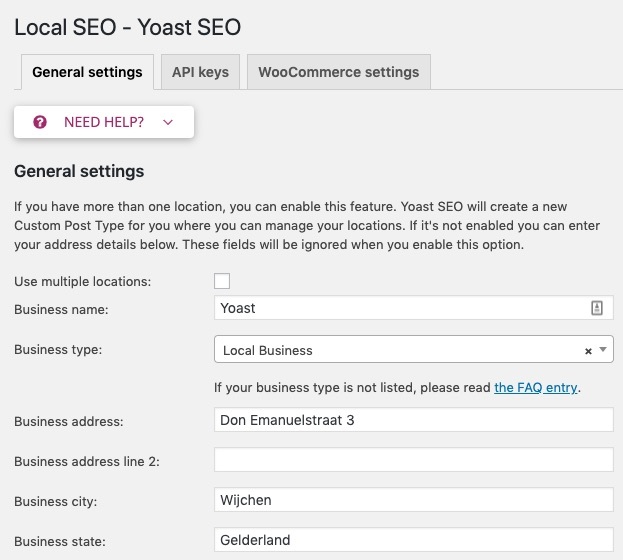 So I was wondering if I do not set a person or organization in Yoast SEO settings and simply leave the dropdown as is (asking me to select one of the two), then I suppose the plugin wouldn’t output any extra schema that may conflict with my current setup (except for breadcrumbs schema). Sounds great! I will definitely update. Will it automatically generate article schema markup? What if the theme already does it automatically? Will it create conflict? Well if the theme already does this it should probably have an option to disable that. The theme lacks a lot of meta data that Yoast SEO, being a plugin, does have access to, so it’s probably better if it comes from us. I also would like an answer to this. What if the site is already properly Shema’d? Will Yoast leave override anything? add this to your functions.php file. In order to not break future functions attached to the filter, you need to pass an array. This will return an empty one for you. After the update on April 16, lines of code appeared before the site. How to fix it? Are you running a plugin that tries to remove Yoast comments or something else? Thanks a lot, this was issue on my site! Thanks for this great update and a quick question. Now that your plugin covers scheme markup, does this mean I can not get rid of my Markup (JSON-LD) structured in schema plugin? We used this for years for our news site plus it covers AMP pages. It would be great to eliminate another plugin. I think so, but can’t say what that added, so you can just disable it briefly and use Google’s Structured Data Testing Tool to verify no important information gets lost. Thanks. When I deactivated the Markup (JSON-LD) the Organization info gets lost. It’s odd because when I do Page Source, it shows up but the Google Structured Data Testing Tool can’t seem to find it. Very odd. Nice and compact. Thanks so much!